1- Place a large skillet over medium heat and add the olive oil. 2- Add the garlic and onion and stir , do not brown. 4- Add the spinach, mushrooms, chicken stock, salt and pepper. 5- Stir frequently for about 4 minutes or until the spinach is wilted and mushrooms have released their water. 6- Remove from heat, drain the liquid from the veggies in a colander by pressing the veggies against the side of the colander with a spoon. Don’t get nuts about it as you want some moister left after they drain. Place aside to cool at room temperature. 7- Place the turkey meat in a large mixing bowl. Combine the cooled veggies, dijon mustard and the egg into the meat using your hands. 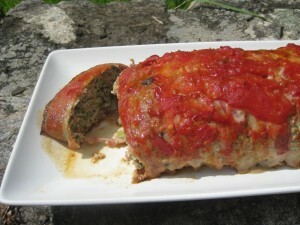 8- Place the mixture into a loaf pan and form the meatloaf by tucking around the edges. 9- On a flat surface layout a large piece of saran wrap. 10- Place the bacon strips tightly side by side. Then flip the loaf pan on top of the center of the bacon slices and hit the bottom of the loaf pan to release the meatloaf. 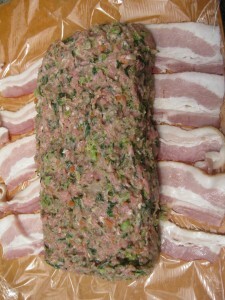 11- Wrap the bacon around the meatloaf until both ends meet.Then do the same with the saran wrap to form the loaf. 12- Line a medium size baking sheet with foil. Grab the ends of the saran wrap and flip the meatloaf onto the baking sheet. Remove the saran wrap slowly by titling the loaf back and forth. Gently push the ends of the loaf towards each other and do any reforming that is required from a sloppy flip. 13- Pour 1/2 cup of your favorite homemade tomato sauce over the top of the loaf and bake for 35-45 minutes or until the internal temperature is 165. 13-Before removing the loaf , broil for 2-4 minutes to crisp the bacon. Watch it carefully or you will dry out your loaf. 14- Let the loaf sit for 5 minutes. 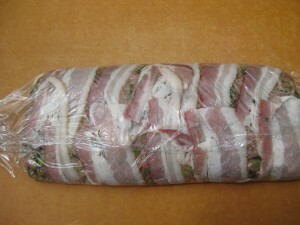 Then cut into slices, cutting each slice so it is wrapped in its own slice of bacon. This entry was posted in Recipes and tagged diet, The Missing Ingredient Frank Baldassare, The Missing Ingredient gluten free grain free recipes, The Missing Ingredient gluten free TV Show, The Missing Ingredient paleo, The Missing Ingredient TV. Bookmark the permalink. ← The Missing Ingredient® power breakfast, Poached eggs & bacon in an avocado boat.